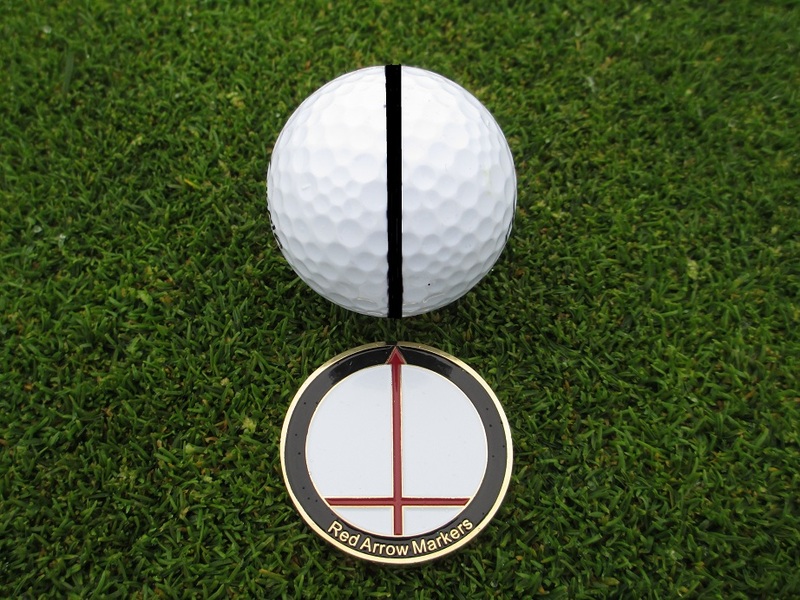 Red Arrow Markers has changed the way we use ball markers. Its not only a ball marker, it is a ball alignment and slope bar tool in one. Many top tour players and weekend golfers use a line on a golf ball when putting to help align their ball to the hole. However, this can be difficult at times and can lead to an inaccurate alignment. Red Arrow Markers has solved this problem with it’s Patented #D662165 ball alignment arrow and horizontal slope bar. With the ball in place, simply point the red arrow towards the ball path creating a visual line of reference. Then view the horizontal slope bar to help calculate “breaking” angles. Make final adjustments by rotating the ball line with the Red Arrow. You are now accurately aligned and ready to sink your putt! Red Arrow Markers conforms to the rules of the USGA and can be used in tournament and recreational play. Red Arrow Markers are a quality golf accessory for your Pro Shop and an excellent tournament gift with logo on the front and promotional information on the back. Golfers love them as a golfing aid and memento and will use them all year long!